Though this disk features two top-notch British Columbia, Canada pop-punk entities, The Smugglers and Bum, I have to say I'm way more partial to the latter. So much so that I've been saving them for a rainy day, at least so far as sharing them on this blog is concerned. That's all going to change starting right about now. The true centerpiece to any Bum collection is their stupefyingly flooring debut, Wanna Smash Sensation on Popllama Records, which I'll be posting in slightly expanded form, as well as a flurry of singles later this summer (for now you can check out Wanna Smash Sensation via an alternate blog). Funny thing about this split single though. Per the liner notes, courtesy of The Smugglers and CBC Radio 2's Grant Lawrence, the record was inspired by a mutual love for the Rolling Stones' Tattoo You long-player (arguably their last truly great album, but that's a topic for another discussion that I'll probably never get around to). What's so odd is that out of three cuts here only one of them is a Stones cover, namely a sloppy, live collaborative rendition of "Hang Fire." Better than one that none I suppose. The A-side is comprised of remakes by Stones influenced bands, DMZ and The Boys. Go figure. Check out Grant's liner notes on the back sleeve for the full scoop. Wanna Smash Sensation is an amazing album! 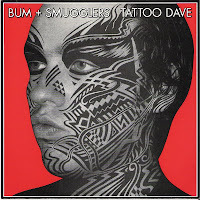 Saw Bum twice within a 2 week period back when they toured that album. Fantastic live band, even though one of those shows they only drew a handful of people. They rocked live I saw them twice (also with modest audiences. WSS is one of the greatest pop-punk albums ever (it was my fourth post when I started my blog). I have a bunch of old singles that I was considering posting but if you get to it first (I hate scanning) more power to you. P.S. Do you have the "Make It Or Break It" L.P. ? Hey Jeffen. Yes, I have "Make it or Break It" and another one called "I am Superwoman." I plan on sharing them - when, I'm not sure. If you beat me to the punch with the Bum singles, so be it, but I have no problem with doing the legwork, so to speak. here's another request - do you have the smugglers "up and down" 7"?